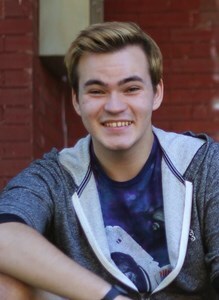 Newcomer Family Obituaries - David Bohdan Mudry 1995 - 2019 - Newcomer Cremations, Funerals & Receptions. David Bohdan Mudry, age 23, of Oakwood, Ohio and Lexington, Kentucky passed away February 7, 2019 at his home in Lexington, Kentucky. He was born November 17, 1995 in Kettering, Ohio to Oleh and Sandy (Errett) Mudry. David followed his brother Chris’ footsteps in joining the Boy Scouts of America. David and Chris shared a passion for all different kind of games and animals. They had a wonderful childhood and will always have true brotherly love. At an early age, he enjoyed horseback riding at Bonnybrook Farms in Centerville, Ohio. David earned his black belt in Tae Kwon Do where he continued to excel throughout his teenage years. He was committed to animal welfare and regularly volunteered with his family at several local humane society animal shelters. David loved participating in Destination Imagination (D.I.) where he and his four teammates were delighted to compete at the state level. Performing in D.I. led him to discover film and theatre where he ultimately found his passion. He had an extensive library and fascination with horror films and their filmography. David went on to participate in many productions within and outside of Oakwood High School. One of his proudest achievements was writing, directing, and producing an award-winning short film called “Don’t Believe the Myths” for CARE Walk, a local breast cancer awareness charity. After graduating Oakwood High School in 2014, David attended the University of Kentucky in Lexington. He graduated in 2018 with honors from U.K., earning a Bachelor’s Degree in Family Sciences with a minor in Theatre. David was extremely active in Alpha Phi Omega (APO), a service oriented fraternity. Within APO, David held several leadership positions including a “Train the Trainers” role in recruiting, orienting, and on-boarding new members. He initiated many new traditions that have become staples at the University of Kentucky, including the Pumpkin Pot Luck, Survivor, and the ever-popular Raw Potato Eating Challenge. David helped so many people in moments of crisis. He had a natural capacity to listen, heal, and love unconditionally. David was particularly sensitive to issues within the LGBTQ community and worked to foster a sense of community and belonging. He dreamed of a fair, kind, and just world. David was especially concerned with and committed to the well-being of at-risk young people in the LGBTQ community. David truly lived as an inspiration to others and continues to do so for those he touched. He was preceded in death by his maternal grandmother, Barbara Errett and paternal grandfather, Wasyl Mudry. David is survived by parents, Oleh and Sandy Mudry; brother, Chris (Elena Bracken) Mudry; aunts and uncles, Pam (Phil) Cox, Doug (Angie) Errett and Roman (Della) Mudry; maternal grandfather, William (Susan Roman) Errett; close family friend, Mark Rozdolsky; cousins, Natalya, Viktor, Emily, Ian, Evelyn and Finn; many other extended family and hundreds of close friends. Family will receive friends Friday from 4-8 p.m. and from 1-2 p.m. Saturday at Newcomer South Dayton Chapel, 3940 Kettering Blvd, Kettering, Ohio where a funeral service will follow at 2 p.m. Private family interment at a later date. Add your memories to the guest book of David Mudry. The first time I really talked to David was when he found out he was going to Alaska in 5th grade and wanted somehow to share that experience with his Dad - or have his Dad go in his place. Despite his excitement, he tossed several ideas around, such as how his Dad might become a chaperone. Ultimately, he decided to enjoy the experience and let his family know all about Alaska. Many of my friends have heard me say if we were ever blessed with a boy, I wish he could be just like David. Such a kind, thoughtful, fun person! We are so sorry he has died so young. Oleh, I was just made aware, and am so very heartbroken for you and your wife and family. May the Lord richly bless you and lead you in His way and timing for your life. I didn’t know David very well but my kids always said he was a kind person. Something we all arrive to encourage our kids to be. I do remember seeing always walking his Beagle and I knew he volunteered at places caring for the animals. Anyone who loves and cares for living things and beings who can’t care for themselves is selfless. His heart must have been huge to give as much to others as he did. What a tremendous loss to humanity and to your family that David is no longer here to do that work. As many have said, he will carry on his gift of love and giving through those who’s lives he touched. I am so sorry for your pain of loss. There can be no agony for a parent like the loss of a dear child. David will be missed by many from all walks of life. God Bless David and his family. Like to send my condolences to you and your family. May GOD rest his soul and he is at peace with GOD. Dear Sandy, I am so sorry for your loss. I never met David, but I am sure that he was one of a kind. I will keep both him and you in my daily prayers, and if I can do anything for you please let me know. When I first met David, we were little kids in kindergarten. We didn't know what we'd become, who we'd meet, or what we'd make of ourselves. We just had good times talking about Pokemon, because it was one of the new shows on Cartoon Network. I remember he wanted there to be a theme song for his DI team, so he told us on the play ground one day in elementary school that the person who came up with the best song would be able to come with him on their next competition. I spent that entire recess period trying to think of something that would make him choose me. There were other things we did together too, like horseback ride. When Bonnybrook Farms was still in existence with their array of different horses(and one whole mule), David and I would go there every Saturday and ride horses. Eventually, my mom and Sandy carpooled and we shared a lot of car rides together there and back. I always remembered passing the U-Haul place and reading all the interesting things out-loud. The funniest time though, was when we went to Skyline Chili afterwards and I ended up getting the wrong thing. I now know that my order is Spaghetti and Cheese due to that incident. David and I were both voted as "Most Unique" in our Senior Yearbook, which rings really true to me. David was someone who was unique, and honestly I can't think of anyone like him. He was extremely kind, but also had this snark to him that made him so strong. I'll miss David, but honestly, I won't forget him ever. He was someone who changed my life for the better, and allowed me the courage to be myself even in times of adversity. I have known David for a while and some of my fondest memories from my childhood were with him. Whether it was joining his DI team and coming up with the most ridiculous things a 4th grader could think of or joining Boy Scouts for a year because I knew he was doing it, I always knew I had a friend in him. I can go on to list the many memories I shared with him from our time in Kindergarten until we graduated but as I think back the most important thing about those memories wasn't what happened but the feelings associated with them, and they all had one overarching feeling of joy. Whenever I was with David he made me smile, laugh, and brought me happiness. Though I have not seen him since we graduated, I still loved to see what he was doing and whenever I saw his posts or statuses they would always make me happy because that's what I associated with David, happiness. He was a great man and a great friend. I will miss him a lot but I know those memories and those feelings will be with me forever, and for that, I am eternally thankful. I remember meeting your son at Chappy's when Mark and I had met you and your family for dinner during one of the holidays. His smile and quick wit we remember so clearly! Know our thoughts and prayers are with you and your family at this time and that our hearts are also very saddened by your tremendous loss. New Years Eve 2017-2018, David came over to my house with his partner Dakota. We spent the evening ringing in the New Year playing Monopoly. David spent the night smiling and hoarding the railroads because he knew I wanted them. I will remember David's big smile (that had a way of making you smile), and his plot to steal my properties. He was a good person who loved Dakota, his family, and his community. I'm very sorry for your loss! Sending prayers that your family can find peace with the wonderful memories I am sure David left you with. I remember a fun loving adventurous little guy that everyone loved. Our deepest and heart felt condolences on your loss. David was an extraordinary kind and compassionate young man who made our world better. I will never forget David’s big, beautiful smile, contagious laugh and sharp wit. My heart breaks for the pain you’re in. You need to know that your precious, loving son will live on in the hearts and memories of everyone who had the pleasure of knowing him. My God bless you and your entire family now and in the months and years to come. There are no words that adequately express my sadness for you and your family. I did not know your son, David. I am sure that he was an talented and compassionate person. Why am I sure? Because I am sure that he learned it from his parents. That is what breaks my heart; knowing how this must affect you. I can only imagine how how I would feel in your situation and I don’t know how I get through it. But I am sure that it would affect me deeply and that it would take time to grieve. Please know that you will be in my prayers. I have asked others to pray for you. You are not alone. Others care about you. To the Mudry family, so, so sorry to hear of your great loss. Sorry to hear you lost your David. We will pray with and for your family. God bless you all. Oleg and Sandy my heart breaks to hear about your loss. He sounds like a wonderful young man and this world, along with you, have suffered a great loss. My prayers are with you and I pray you will receive comfort and strength. I’m so very sorry seems inadequate. My prayers are with all his family and friends who have lost someone so special. May your memories of David bring you peace and comfort. I worked with David for one summer at Camp Ernst and we spent a good chunk of time together, although we never got to be very close. Spending time with him was always a breath of fresh air. He was so good with kids, funny, and inspiring. I remember a camper telling him that he thought another kid was "a gay" and David handled it beautifully, with love and humor. I'm shocked and so sad to hear of his passing but the things he's done for others will be a part of this world for a very, very long time. I hope to carry his love in my heart and bring it to others, close friends and strangers alike, the way that he did. I'm sending all of the love that I can to you and your family and friends, David.